I have recently seen an increase in the interest from clients wishing to invest in DR and Backup to the cloud. 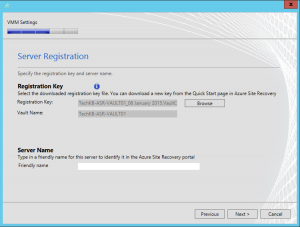 Azure Site Recovery Services has many offerings for various scenarios, with additional options appearing all the time. 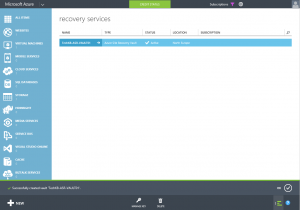 I have discussed Azure Backup Vault in previous posts and no doubt will touch on it again in the future, but today I have chosen to look at DR and Azure Site Recovery. Essentially, Microsoft Azure Site Recovery offers the ability to simplify and automate DR between two on-premise site or between on-premise and Azure. Microsoft are developing ASR rapidly and additional functionality is always appearing, with much to come in Q1 and Q2 of 2015. For this particular post I will be focusing on the Between an on-premises VMM site and Azure option. 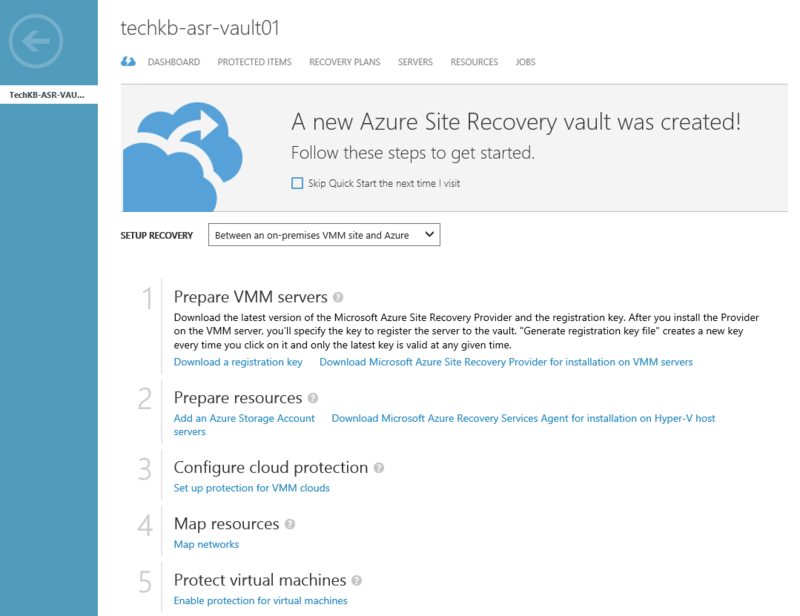 The first step to configuring DR between an on-premises VMM site and Azure is to create a Site Recovery Vault. To do this, open the Azure Portal and select the Recovery Services tab on the left menu. Next click + NEW at the bottom of the screen which opens the window required to create a Site Recovery Vault and a Backup Vault. 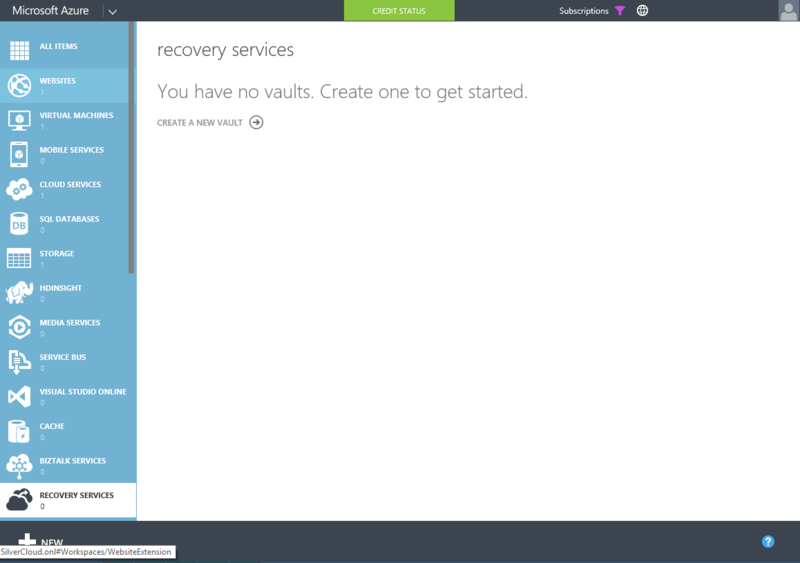 Select Site Recovery Vault, then give the vault a name and select the region where the data should be stored. 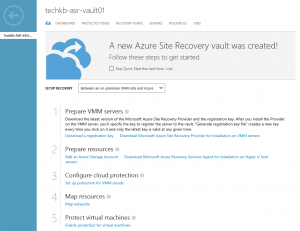 After the job has completed, the new Site Recovery Vault appears as Active. Now the ASR Vault has been created, the next step is to configure the local Hyper-V and VMM servers. Click on the new ASR Vault to open its Dashboard. Download the ASR Provider and Registration key. 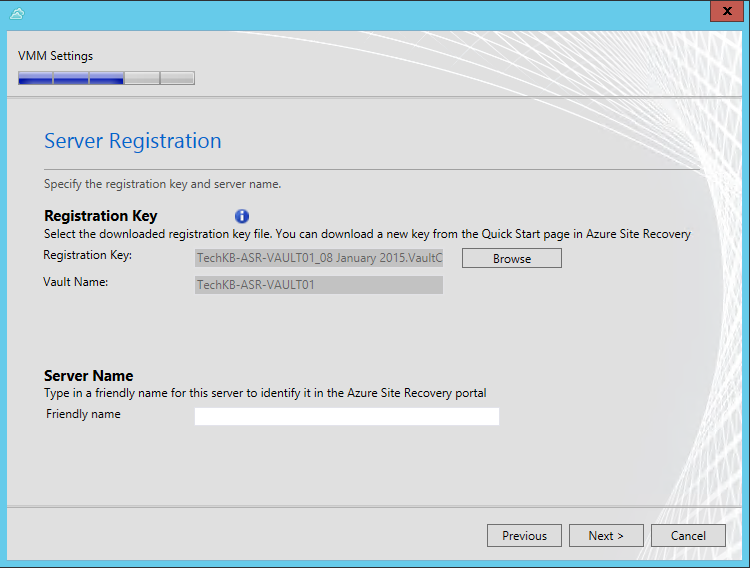 Install the ASR Provider on the VMM server and register against the ASR Vault by using the registration key. NOTE: If you are running VMM in HA, the first step is to install the ASR provider on the active node, then register the server. Then secondly install the ASR provider on the passive node. 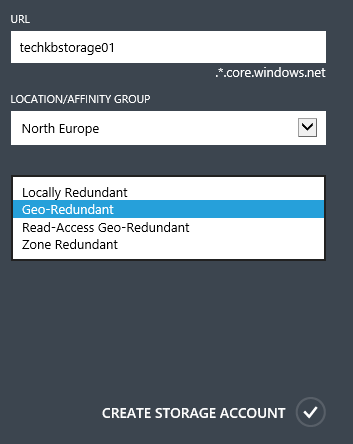 Return back to the Dashboard and then select to Add an Azure Storage Account. Give the storage account a name (lowercase case and numbers only). 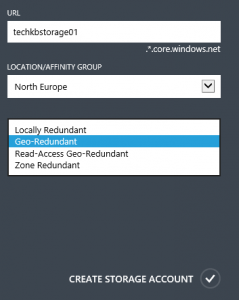 Select the location of the storage account and the chosen level of redundancy. Once the storage account has been successfully created, it will appear under the Storage tab of the Azure Portal. The final step is to download the Azure Recovery Services Agent and install on all hyper-V hosts. When installing the agent, the agent is smart enough to detect if there is a previous version present and attempt to upgrade it. 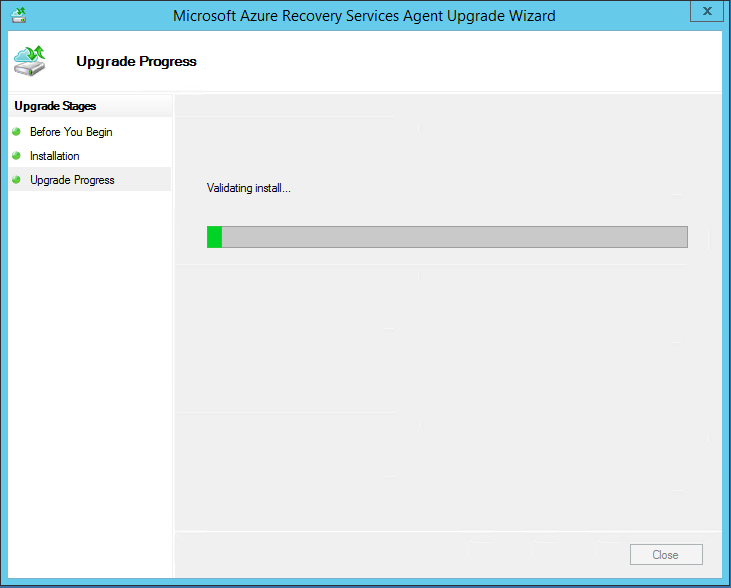 This is how the Azure Recovery Services Agent looks when its upgrading a previous version. 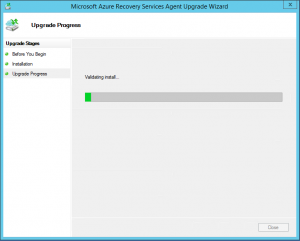 Now the Azure Recovery Services Agent has been installed on all the Hyper-V servers, this seems a natural point to end this first post. In summary, the on-premises Hyper-V and VMM servers have been configured and registered to the created Azure Site Recovery Vault. Everything is now in place to begin configuring the protection of on-premises clouds and resources. I have recently been involved in designing and deploying a Hyper-V and SCVMM environment for Landmarc Support Services. They have since spoken at Microsoft Future Decoded, based around the road map used in building a private cloud within the MOD. I have been on a number of customer sites recently that have had System Center Virtual Machine Manager deployed as HA and were looking to install the latest Update Rollup. I have made note of the steps and the order, that has been suggested as the best in this scenario. The first thing I would say is, wait at least a month before installing Update Rollups in your production environment. It has been known for Update Rollups to contain bugs and be called back. Assuming that the Update Rollup has been given chance to bed in, the following steps can then be used to deploy it. Right-click the AddInPipeline folder, and then click Properties. On the Security tab, click Advanced, and then click Continue. Select the BUILTIN group, and then click Edit. Click the Select a principal link, type Authenticated Users, and then click OK.
Click OK to close each dialog box that is associated with the properties. 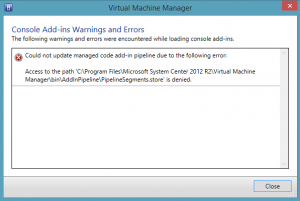 The steps for this fix were originally taken form the Microsoft article below which relates to Update Rollup 1 for SCVMM 2012 R2 and a potential issue that might be encountered.